Italica publishes critical studies on all aspects of Italian literature, culture, cinema, linguistics, language pedagogy, as well as interdisciplinary and comparative studies. The journal has a section devoted to translations of Italian major works/authors, cultural debates, and interviews, and is receptive to all scholarly methods and theoretical perspectives. Manuscripts and editorial communications should be sent via email and/or attachment (MSWord) to the Editor, Michael Lettieri (michael.lettieri@utoronto.ca). Attachments should be marked with the last name of the contributor, followed by the name/subject of the paper (e.g. Smith-Ariosto or Smith-Romanticism). Contributors are asked to provide a cover page with their name, complete affiliation address, phone number(s), and email. Italica has a blind referee policy, and all submissions are evaluated by at least two readers. The editorial staff will remove the cover sheet from the manuscript before sending it for evaluation. Obviously, a running head with the author's name should not be inserted in the manuscript, but pages should be numbered. A brief bio (50 words max.) should accompany the manuscript in a separate attachment. Submissions must conform to the MLA Handbook for Writers of Research Papers (please refer to the sixth edition or to subsequent editions, with particular attention to chapter 5: "Documentation: Preparing the List of Works Cited"). A brief illustration of the MLA documentation style is described in chapter five of the Handbook (see www.aati-online.org/documents/italica/guidelines.pdf). Books for reviews and reviews should be mailed, as a Word attachment, to the Book/Media Review Editor: Giuseppe Cavatorta, Department of French and Italian, Modern Languages Building, University of Arizona, Tucson, Arizona 85721-0067 (beppe@email.arizona.edu). Reviewers must contact the Book/Media Review Editor prior to writing a review, to ensure that the proposed review has not been assigned. Bibliographical information to be included in the "Bibliography of Italian Studies of North America" should be sent to the Editor. Manuscripts simultaneously submitted to other journals or previously published will not be considered. Contributors must be active members of the AATI at the moment of publication. For membership to the Association, see the AATI website (www.aati-online.org) and follow the link "AATI Membership." Authors agree that copyright for their published article is transferred to the AATI. 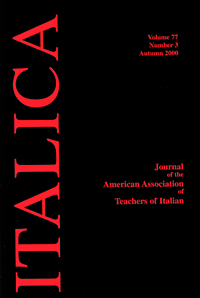 Authors of articles receive two copies of the issue in which their article appears. Additional copies of the journal may be ordered prior to publication at a reduced price.